The Final Girl is familiar to even the most casual horror film fan. She’s the one character who eludes the killer for the entirety of the movie and is often charged with confronting the villain in the climactic scene. In other words, she’s the character the audience focuses on and identifies with, and as Clover put it, “she is by any measure the slasher film’s hero.” Famous examples include Sally Hardesty in The Texas Chain Saw Massacre, Laurie Strode from Halloween, and Ginny Field in Friday The 13th Part 2. For Clover, the presence of these complicated, strong-headed women was a significant step forward for women in the horror genre. While she admitted that viewing the slasher’s Final Girl as a feminist icon was “wishful thinking,” she also argued that the trope marked progress. Referring to the audience’s ability to empathize with the character on screen, Clover argued that the Final Girl allows “the gaze,” which was consistently male, to become, “at least for a while, female.” The popularity of the Final Girl led Clover to suggest that perhaps these slasher flicks represented a transitional period for gender representation in horror films: Yes, there were still exploitative aspects to the portrayal of the female heroes, but Clover considered the Final Girl’s prominence—and the fact that majority-male audiences were sympathizing with these female characters—to be a stepping stone toward truly equal representation. Recently, games like the 2013 Tomb Raider reboot and The Last Of Us: Left Behind have adopted the Final Girl trope, positioning level-headed female characters as the protagonists in realms where they’re surrounded by horror. Both Lara Croft in Tomb Raider and Ellie in Left Behind—an expansion to The Last Of Us—embody the characteristics of the Final Girl, the one person who can outwit and outmuscle her (mostly male) aggressors. Left Behind offers a different perspective than the main game. In the original Last Of Us, you play as Joel, a middle-aged man whose daughter was killed during the outbreak of a mass viral infection that essentially turns everyone into a shambling, clicking zombie. You eventually come into contact with Ellie, a teenage girl who’s immune to the virus, and you travel post-apocalyptic America in search of a cure. But Left Behind, the downloadable add-on that was released in February, puts the player into the shoes of Ellie. The game jumps between two different time periods. One sees Ellie scouring an abandoned mall for medical supplies to aid a wounded Joel. The other transports the player to a time before Ellie met Joel, as she explores a recently abandoned mall (not yet overrun with infected) with her friend Riley. Like any self-respecting Final Girl, Ellie shrewdly adapts to her surroundings and often ends up flying solo. She figures out how to get a broken-down gas generator running again, smashes in the heads of a few infected, evades the militaristic men hunting her and Joel, and braves treacherous heights to retrieve the first-aid kit from a military helicopter hanging from the mall’s roof. Ellie is a Final Girl not only because the player adopts her perspective and therefore sympathizes with her plight, but also because her “overcoming the odds” character arc is strikingly similar to those played out in slasher films. 2013’s Tomb Raider similarly echoes the Final Girl trope with its imagining of the Lara Croft origin story. In the game, Lara and her fellow researchers are shipwrecked on an island while searching for a lost kingdom. Lara, while separated from the others, must evade the island’s dangerous inhabitants, known as the Solarii Brotherhood, in order to find her colleagues and escape. Much like Ellie, Lara adapts to harrowing new challenges. Early in the game, as she kills a man for the first time, a palpable look of anguish and relief spreads across her face just like so many of the great scream queens who have confronted their would-be murderers. She’s forced to be inventive (a key characteristic of the Final Girl) while in nature, fending off wolves while also crafting weapons. 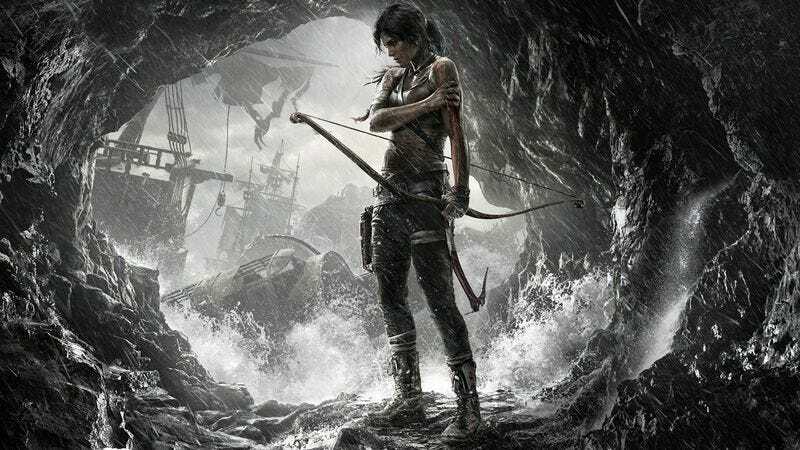 The main takeaway of her scrabbling effort to survive is that nobody is going to rescue Lara; she has to rely on her own ingenuity to escape the threats around her. The similarities to the Final Girl trope also extend to visuals, as the games adopt the aesthetic of slasher flicks. Both protagonists are often covered in blood and mud, not unlike the female leads of the ’70s and ’80s. They must navigate dark spaces while eluding male villains—in the slasher films it would be a closet or a dark basement, and in these games, it’s caves and abandoned buildings. Both men and women are playing as these complex, smart female characters, and while that may not mark a sea change in gender relations, it is “of no small interest,” to use an expression Clover favored. These games are not ideal in terms of how they portray their female protagonists, but the Final Girl isn’t an idealized construction. The qualities that both Ellie and Lara must adopt in order to survive (ie: resourcefulness in their surroundings; brutish violence) are still too often seen as “masculine” traits in video games. Furthermore, Tomb Raider’s advertising campaign prominently and repeatedly used the cringeworthy slogan “a survivor is born,” a wording that was ignorant of loaded language in regards to sexual abuse. Couple that with the fact that the game design and development industry in general still has a depressingly low number of female workers, and it’s clear that gender representation in the world of video games still has a long way to come. Yet if we can see slasher films and the Final Girl trope as a historical example of a popular art form making adjustments to its gender representation, then perhaps the critical and commercial popularity of Tomb Raider and The Last Of Us: Left Behind (the latter of which even includes a storyline with homosexual undertones) is a sign that video games are making their own adjustments. There’s a parallel between the progressive Final Girl of slasher flicks and its current incarnation in video games, and it’s on both players and developers to sustain the momentum and ensure that the Final Girl isn’t the final word on female characters in video games.